I once heard of a woman who was blind and of stately rank, who wore a fine mesh of sense receptors latticed within the delicate weave of the fabric. And it allowed her to walk freely, without guide or implement, save the shining coat itself, which she wore atop all her costumes. And this veil of networked stimuli guided her through the many hallways she walked along and the many rooms through which she came and went, and her attendants always walked some ways behind her so that the folds of her skirt could graze the width of the corridors. And the body of the woman is like the body of the machine, that is, the naked processing core existing as it was when it was first created. And with this fragile body there is much nurturing and adjusting of its network parameters in preparation for the gift of imagination. Upon this core the architect constructs a highly elaborate, metaphysical structure of discernment and interpretation that is made up of many layers, so that the machine can search within itself and build floating castles from pure static. The images rise out of these neural networks, which are like the Blakean spheres of imagination that lead to ideal forms and pure understanding. At each tier, more and more symbols emerge and stretch as far as they can go, until they pass into another realm and so on, upward into the heavens. 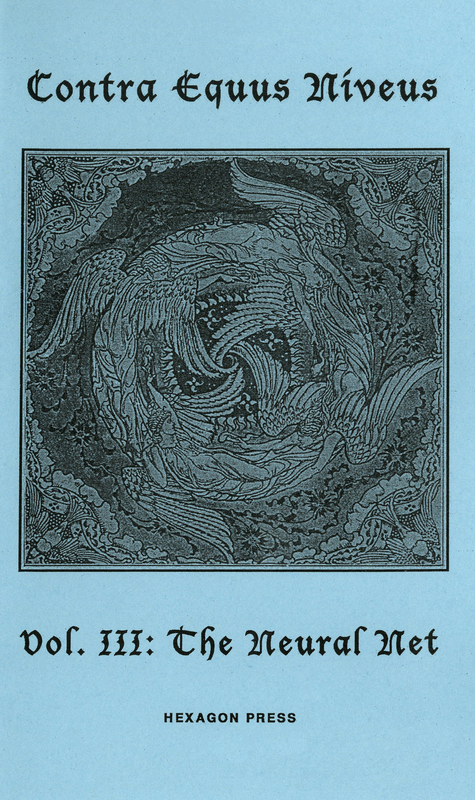 For the third issue of Contra Equus Niveus, Hexagon Press asks its audience to consider the grounds from which these spheres arise, and the many invisible layers of the neural net that allow the symbol to exercise its purpose—in the eyes of the Symbolists, to be a bridge between the real and the mystic realms. In the cold narrative of technological progress, what does it mean to reach such heights when there is no God to greet you? We ask that submitters take what they will out of this, just as the computer has been programmed to run on an interpretative feedback loop, passing through more and more of these neural nets. Up to three poems, no more than one page each. Up to three prose pieces, no more than 300 words each. Broadsheet Number Three will be printed in an addition of 200 individually numbered, cardstock sheets. Due to space limitations and layout, shorter works are preferred.